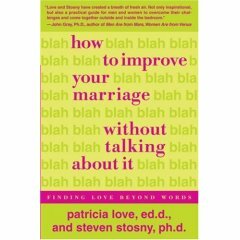 By Patricia Love Ed.D., Steven Stosny Ph.D.
How to Improve Your Marriage Without Talking About It teaches couples how to get closer in ways that don’t require “trying to turn a man into a woman.” Rich in stories of couples who have turned their marriages around, and full of practical advice about the behaviors that make and break marriages, this essential guide will help couples find love beyond words. Have you ever had this conversation with your spouse? Drs. Patricia Love and Steven Stosny have studied this all-too-familiar dynamic between men and women and have reached a truly shocking conclusion. Even with the best of intentions, talking about your relationship doesn’t bring you together, and it will eventually drive you apart.